This year, chef Javier Plascencia and Misión 19 chef de cuisine Omar Reyes presented five courses of the restaurant’s Baja California cuisine paired with Valle de Guadalupe wines within the context of a boxing match. Emcee Javier Gonzalez, dean of Tijuana’s Culinary Art School, announced each dish as the restaurant’s attractive hostess made her way demurely around the room holding up a placard printed with each course number. Our party had placed some early bets on whether the celebrity chef would be slugging it out in the kitchen tonight or enjoying the event ringside. But the hometown favorite had his apron on and his gloves laced, ready to do battle in the squared circle and exhibiting an intensity not typical in one of the region’s most laid-back culinary personalities. The chef displayed some fancy footwork as he finalized the mise-en-place, working his way around the small kitchen ringed with both staff and a camera crew from Televisa who captured and streamed a blow-by-blow broadcast of the chef’s every jab and hook to spectators via a series of monitors in the dining room. Live from the kitchen. Chef Javier Plascencia, Omar Reyes and staff. Plascencia is no stranger to the fight game. In 2011 he had just returned to Tijuana after a self-imposed exile in San Diego due to cartel violence and kidnapping threats against one of his brothers. 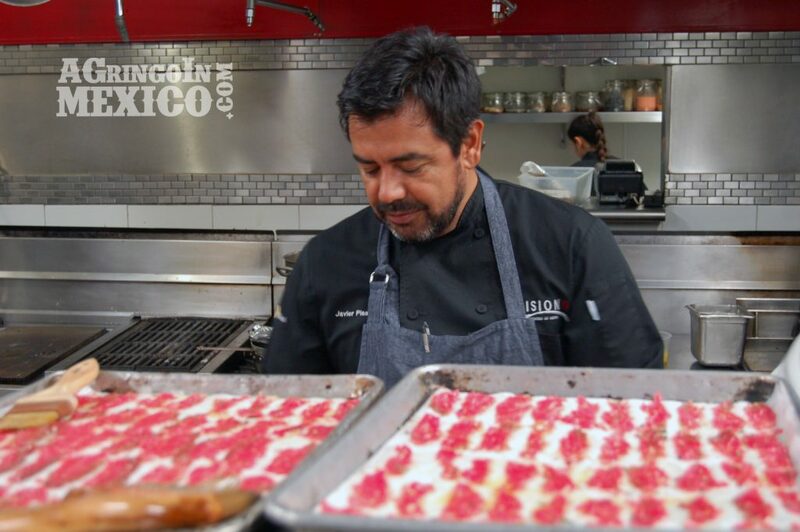 When he decided to open a modern Mexican restaurant in the border city, the odds were not stacked in the chef’s favor. But Tijuana’s growing middle class – many of them also just returning to the city – were hungry for a night out on the town again and Misión 19 was exactly what they needed. 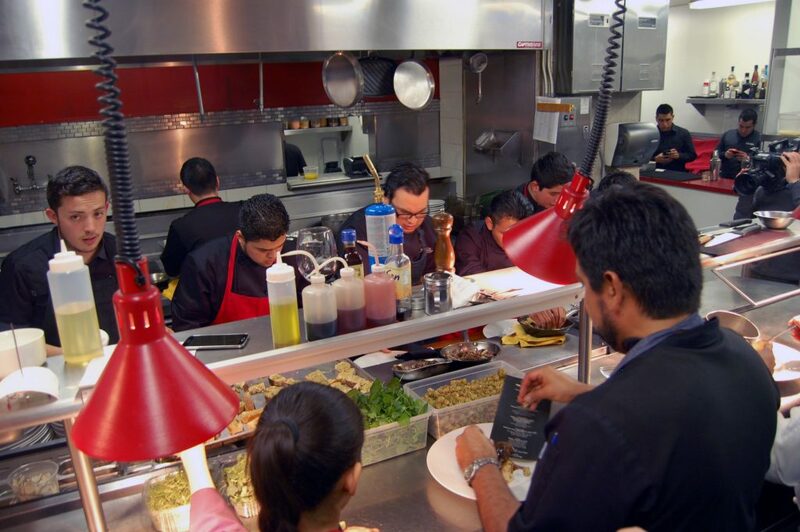 Here, they enjoyed the chef’s new “Baja Med” cuisine that delivered a one-two combo of sustainable Baja California ingredients and moderninzed Mediterranean concepts. 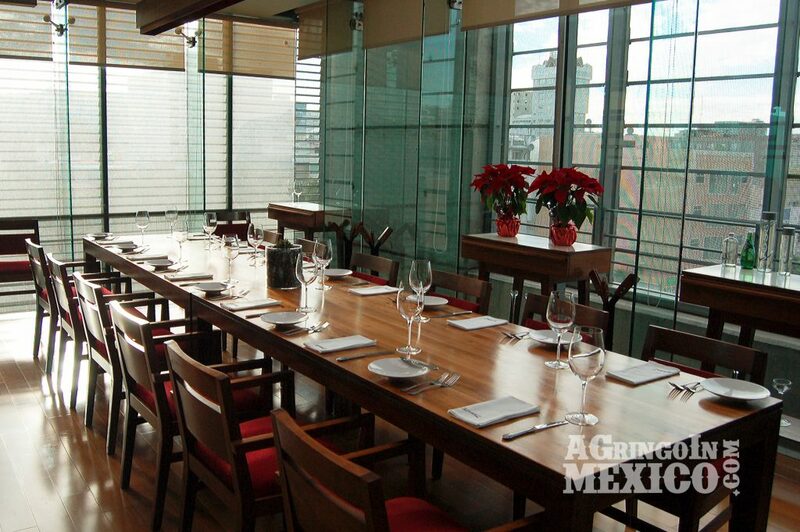 Nestled in a space on the second floor of the modern Via Corporativo building in Zona Rio, the wood, glass and metal dining room exudes class and quickly became THE place in Tijuana to eat, see and be seen. 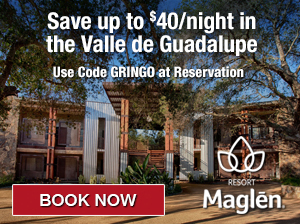 “Many of our guests are also executives from the nearby maquiladoras who like to entertain their clients here,” Plascencia shared with me in a 2013 interview, “We also get some of the city’s medical tourists. We are trying now to get people to come back from the U.S., especially San Diego, to try our new cuisine.” Judging from the mixed crowd of locals and gringos in the stands that night, Plascencia’s scorecard looks solid on that front. When our party arrived at Bar 20, the restaurant’s upstairs lounge, we were went two rounds with a refreshing cocktail of cerveza, pisco and kiwi and shots of pechuga (chicken breast) mezcal. Those of us not driving that night began to feel a little punch-drunk, but shook it off and were escorted to the dining room downstairs for the main event. The room was filled with a who’s who of the region’s culinary industry. Spotted ringside: Fernando Gaxiola of Baja Wine + Food, chef Claudia Sandoval winner of last season’s Master Chef, Mark Lane of San Diego seafood purveyors Poppa’s Fresh Fish, Josue Castro of Tijuana’s The Kitchen Project, Julio Marruffo of Marruffo’s Tours a Viñedos y Eventos, Jessica Cline publisher of Modern Luxury Orange County, Michael Gardiner of San Diego City Beat and many more. 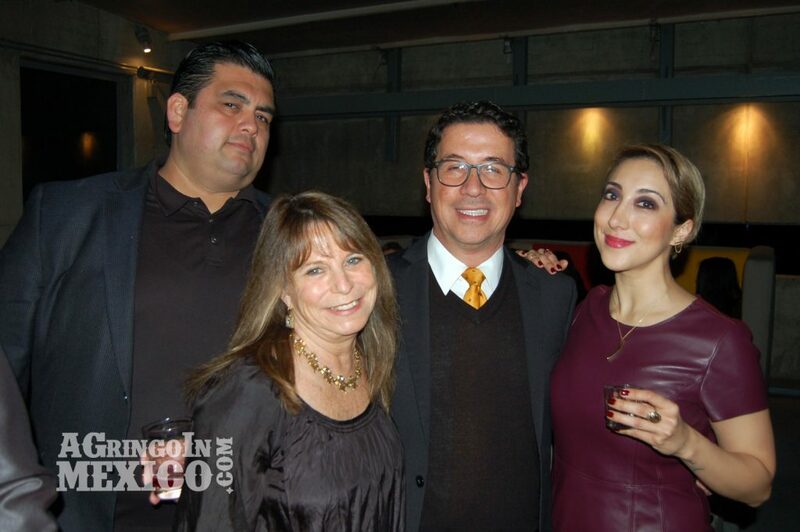 Julio Marruffo, Wendy Lemlin, Javier Gonzalez and Karla Navarro. Chefs Plascencia and Reyes’ anniversary menu paid homage to the regional cuisines of Baja California. 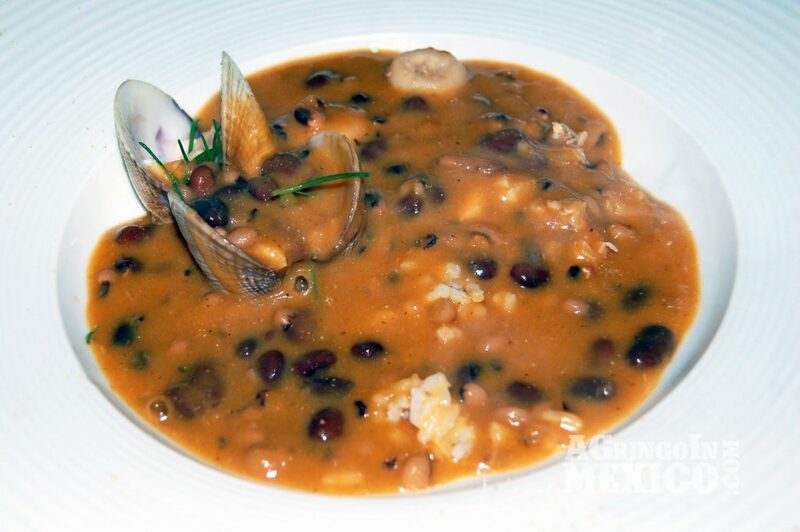 A Popotla-inspired rich, peppery broth of sea urchin and beans poured over a deconstructed soup of spider crab, clam, dried shrimp dumplings and smoked Morelos rice provided the knockout of the five tiempos. Other dishes included a trio of Baja hiramasa, a confit of local borrego (mutton) cooked in a caja China, and an Asian báhn filled with a barbacoaof local mushrooms and buttery escamoles (ant larvae) in a rich, dark salsa made ‘drunken’ by a dash of mezcal. Bean and sea urchin broth over clams, spider crab, rice and dumplings of dried shrimp. As the final bell rang, the prizefighter emerged to greet his fans, a little bruised perhaps, but mostly victorious in the evening’s card. 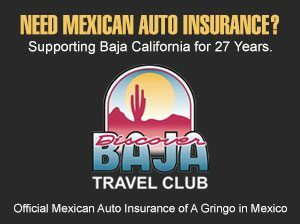 As the arena emptied into the night – with some heading back upstairs for the after party at Bar 20 – all bets were settled and the odds look good for another five years for one of Baja California’s modern Mexican heavyweights. Misión 19 is located at Calle Misión de San Javier, second floor, Zona Urbana Río, Tijuana. (52) 664-634-2493, www.Mision19.com. The author was invited to the dinner at Misión 19 as a member of the press and has not received any compensation from the restaurant or its affiliates for writing this article. All opinions are those of the author who has been a paying customer at the restaurant on past occasions.